News from LMCU: Introducing Max Equity! 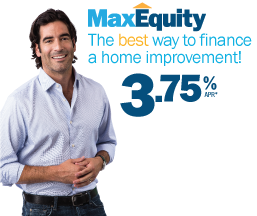 Our MaxEquity program is the perfect way to affordably finance home improvements, renovations, repairs and appliance purchases. MaxEquity features incredibly low rates…so you can also save money by consolidating your high-interest debt. You can pay off the balance on your own terms. • No annual fee…no prepayment penalty! • Variable rates as low as 3.75% APR*, tied to Prime. • No additional underwriting (no out-of-pocket costs). • Great for home renovations, repairs or debt consolidation. Visit any LMCU branch today, or call (616) 242-9790 to apply for a MaxEquity line of credit or fixed rate loan! *Annual Percentage Rate (APR) as of June 19, 2013. Variable rate loan is .50% above Prime and is linked to Prime. The maximum APR will not exceed 12%. Rate assumes autopay from LMCU checking account.